London, United Kingdom, February 22, 2019 --(PR.com)-- Robots Of London have launched their new and improved AI robot receptionist application for Pepper The Robot. Robots Of London were instrumental in the first full time robot receptionist in London and have successfully deployed robot receptionists in 5 European Countries. Pepper, designed by SoftBank Robotics, is the first robot with the ability to recognise principal human emotions and adapt her own behaviour accordingly. Pepper will interact autonomously with visitors to any office and handle deliveries as well as dealing with arranged meetings by messaging the meeting organiser to inform them of their visitors’ arrival. Pepper is able to check for meetings that have been made internally to ensure that visitors are treated to a seamless experience. Drinks orders can be made via the robot interface and the software has a chat integration so anyone can chat with Pepper and have a better understanding of the Company that they are visiting. 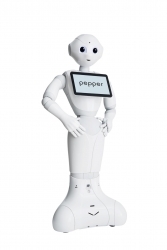 Pepper is able to conduct a health and safety briefing, saving both time and money. Robots of London is one of the U.K and Europe’s leading robotics companies working with multi-national organizations and smaller operations to bring innovation and unparalleled service to a range of sectors, in locations across the globe. The developers set the standard for a number of "off the shelf" software solutions for Pepper the Robot as well as NAO, and we are additionally able to develop bespoke software for hospitality, property, healthcare and retail.